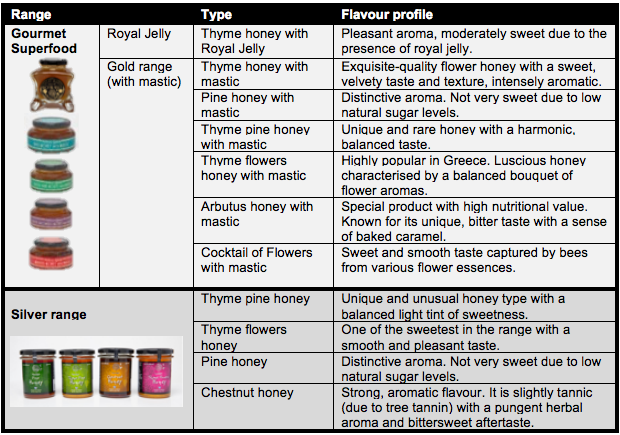 I was recently sent 4 bottles of Hellenic Gaia's honey to sample, and I'm here to review them! I was rather excited when I heard that I'll be receiving some because honey is one of the most underrated food items out there, and like a bear from the cartoon I cannot get enough! I learnt that 'hellenic' means anything pertaining to Greece, and Gaia means Earth, so this honey brand is all about what the Greek Earth has to offer. I received all 4 flavours from the Silver Label (S$13.95 per bottle from Cold Storage, Prime Supermarket, Mustafa Shopping Centre and MY Outlets). They also have the more premium Royal Jelly and Gold Range (S$128 per bottle from Yue Hwa Chinese Products Emporium and all OG outlets). Raw & Unfiltered: Collected from Mt. Pageon and other areas in Greece, Hellenic Gaia's honey is raw and unfiltered, meaning that it is not heated, pasteurized, or processed. Contains natural nutrients: In contrast to pasteurized honey, raw honey is an alkaline-forming food containing natural vitamins, enzymes, powerful antioxidants and other important natural nutrients – the very ones that would be destroyed during the heating and pasteurization process in other types of honey. What I am having now is a mild cough from a itchy throat and I have been drinking the thyme flowers honey with lemon. While I really can't taste much of the thyme flowers, it's done wonders to help soothe my throat! I also like to add a small tablespoon of it to my drinking water bottle just for a hint of sweetness in the otherwise very plain water. The possibilities are endless! I like the genuine taste of the honey and how it is not processed, and how it is from Greece (where they could do with some support). I'll highly recommend everyone to check out Hellenic Gaia's honey in all good supermarkets.